Offensive Ground was formed in September 2011. In February 2014 the band hit hard. After nearly three years of playing together, three of the original members decided to leave the band because they felt that their ambition was no longer in line with Alvaro and Tian. It was a hard strike. A few weeks earlier, the band had been chosen among 200 bands, as one of 16 bands to compete in Sweden semifinals in Wacken Sweden Metal Battle, with the chance to get to one of the world’s biggest rock scenes: The Wacken Open Air 2014. Alvaro and Tian had no intention to cancel and they did everything in their power to get to the race. In less than a week, they found a new drummer, Stanislav Pokhilo, and a new bassist Niklas Storvall. In less than four rehearsals, they managed to do two songs and succeed to come to the competition. After this great achievement, neither Alvaro or Tian had to worry about Stanislav or Niklas could handle the task. Stanislav Pokhilo, drums and percussion. As the band got new members, the sound of the band changed drasticly. From having had a more melodic sound in their songs in the beginning of Offensive Ground, now the sound became more aggressive and the songs started to become more and more technical. After this successful fusion of new blood, the band decides to record what will be the band’s first album. In September 2014, Offensive Ground enters Garage Land studios in Umeå under the guidance of producer Ronnie Björnström, better known as guitarist for the death metal band AEON. It was be a busy and intense week for the band, resulting in their first album titled REBORN. After the album was finished, it became quite clear that Offensive Ground had become a new band when it comes to sound, technic and professionalism among the new mix of band members. Together, all members determine to shut down and remove all the old material they had published before 2014. This for the simple reason that the band, does no longer want to be associated with the old sound. 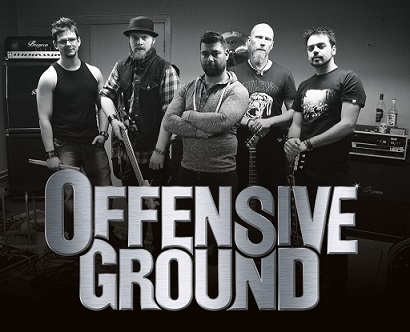 Today Offensive Ground has recently released the single “Mistake” from the upcoming album “Reborn”. The whole album will be released the 15th of January 2015.